Yum! That's a nice update. 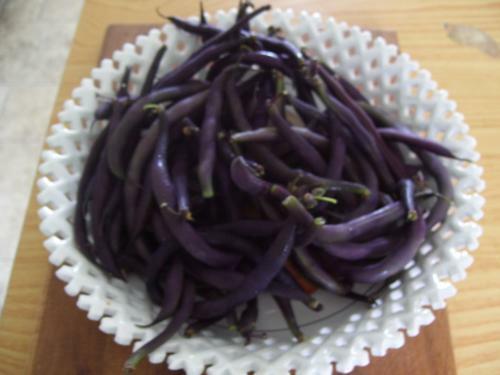 I would love to taste a purple green bean. 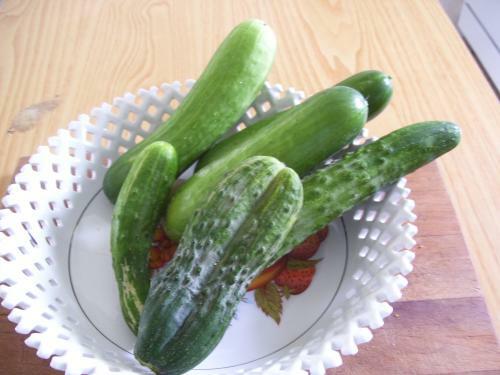 I'll bet it is "good luck" to get a twin cucumber, don't you think? And I like the unique pic of the spaghetti squash too. What do you like to put on top of your spaghetti squash when you cook it? I love to bake it and eat it just with butter and s&p. I hope twins are good luck. It's going to make a third jar of delicious pickle. I'd love to taste that pickle. 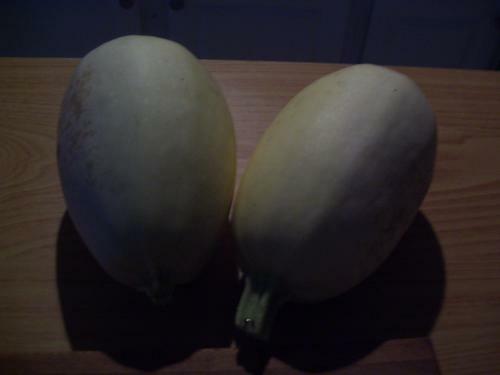 And the spaghetti squash. And the beans. They all look delicious. Those purple beans look smashing!! Are they just as easy to grow as 'normal' green beans? I'd like to give them a go next year. The beans turn green when cooked and, in my opinion have better flavor. Though they look tough, they cook up so tender. My husband said, "I've eaten too many canned beans. Now I know what they're supposed to taste like!" That's a nice haul, GG. I just know that you've enjoyed those veggies. Will you freeze those beans in? I grew some once and they were called "Purple Queen". I think that there are several different purtple beans. Do you recall which ones you have grown? The veg looks so good. Makes my mouth water.